Liberty Urgent Care has been named one of the Best Urgent Care Centers by the Women’s Choice Award ® , America’s trusted referral source for the best in healthcare. “We are on a mission to empower women, the Chief Healthcare Officer for the family, to know where to go for the best healthcare. Considering Urgent Care is growing in popularity its critically important consumers are educated on where to go and when to go or not go to the hospital ER” says Delia Passi, CEO and Founder of the Women’s Choice Award. 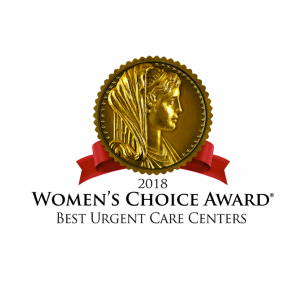 Urgent Care Centers eligible for the Women’s Choice Award were evaluated based on their customer ratings, treatment and services offered, diagnostic tests, operation hours, licensed professional availability and acceptance of Medicare and Medicaid. Accredited centers must be accredited by the Urgent Care Association of America (UCA), the National Urgent Care Center (UCCA) and / or the Joint Commission (JC). Accredited centers must also maintain an overall customer rating of 3.7 or more and a minimum of 20 reviews. In order for non-accredited facilities to qualify, their overall customer star ratings had to be 4.0 or greater with a minimum of 25 reviews. Centers that met the requirements in all areas qualified for the Women’s Choice Award. have met the highest standards for urgent care in the U.S. by the Women’s Choice Award.